"Chalmers certainly milks us dry of laughter and tears...an acting tour-de-force for Chalmers, who ricochets at dizzying speed between different vocal intonations and mannerisms. Each character is incredibly vivid"
"the Norfolk-born playwright and actor, at the age of just 26, puts on both a physically and mentally provocative performance. Stripped is one of this year's gems"
"Chalmers as an actress gives a master class in playing multiple roles seamlessly... Her performance as each character is so layered that visualizing the various people was easy...a unique and talented performer." "The performer has a lot of fun with her story, impersonating a whole host of characters along the way...Her story exposes the real economics of the adult-entertainment world as well as looking at the emotional effects upon those who work in it...an entertaining and thought-provoking piece of theatre"
"the young actor/writer Chalmers seems to have a natural instinct for theatrical storytelling and comic timing...a really perceptive actor and writer"
"A kaleidoscope of absorbing characters are created by one actor in this play...It is easy to believe in all of these, and Hannah Chalmers moves seamlessly back and forth between them. This is an exquisite display of virtuoso acting"
"Chalmers portrays a variety of characters with such precision and charm creating a show that is engaging and riveting throughout....The script is very well written, undulating between sharp and comic to moving and poignant...Chalmers is a brilliant comic actress"
"Chalmers' characterisations are superb, and as she endows each person with their own distinctive physicality, she completely holds the viewer's attention...expect to be entertained and moved"
"writing and performance are so perfectly pitched that it succeeds in being both genuinely affecting and funny...Armed with an impressive range of accents, Chalmers conjures an array of characters...So well-studied is her performance that even the scene depicting the sleazy male Scottish manager getting a private dance is utterly convincing"
"there's a breezy, light-hearted charm about this production, largely a product of Chalmers' megawatt personality...compelling and entertaining...a very funny performance"
"The play expertly balances the humour with the themes and is further enhanced by Chalmers and her incredible one woman performance as she slips expertly between nearly a dozen characters." 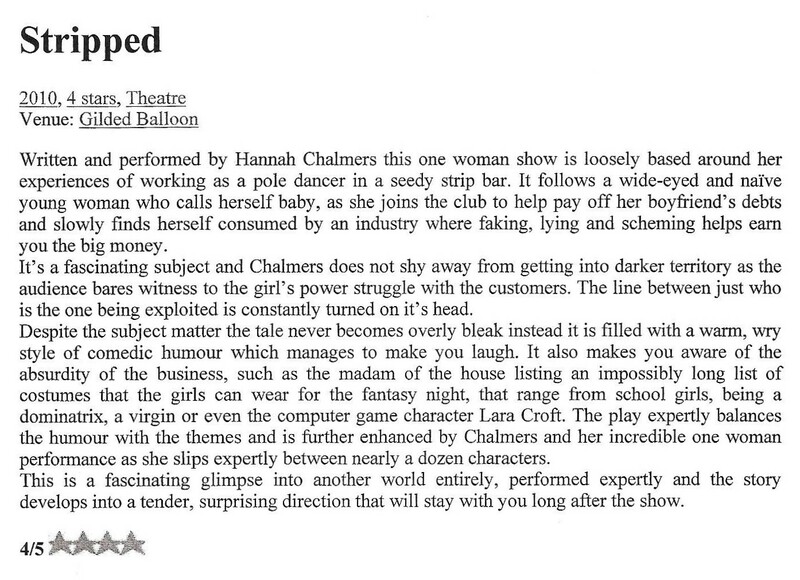 "Hannah Chalmers proves herself a versatile performer in this one-woman show, dropping comfortably into an array of archetypes"
"Chalmers is an engaging performer and seamlessly shifts character, clearly distinguishing each. Her talent engages throughout and as a result the audience genuinely experience a number of emotions as we follow the story"